At Swarthmore College, Michael Dukakis learned that local barbers wouldn't cut black people's hair, so Dukakis became an underground barber. There were very few black students at Swarthmore, but Dukakis cut their hair, and the hair of white students who wanted to boycott the racist barbers -- and he did so without a barber's license. Even at Swarthmore, though, classmates say Dukakis was planning a career in politics. He went on to Harvard Law School, and after graduation he was immediately elected chair of the Democratic Party's organization in his home town of Brookline, a suburb of Boston. Two years later, in 1962, he was elected to the state legislature, and after four terms he ran for Lieutenant Governor in 1970, and lost. He ran for Governor in 1974 and won, lost in '78, then won the governor's chair again in 1982 and 1986. Was he any good as governor? In his first term, he inherited a big budget deficit and high unemployment, and things were a bit better by the time he was booted from office, but not enough better to impress voters. 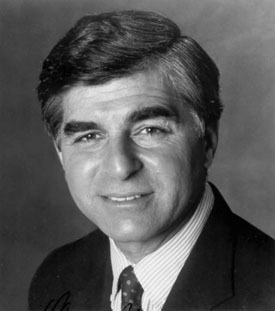 In his second stint, the state's economy brightened enough to be called "the Massachusetts miracle", but it was already fading by the time Dukakis received the Democratic presidential nomination in 1988. "Only in America could the son of Greek immigrants be the nominee of his party for the presidency", Dukakis said in his acceptance speech, and in hundreds of speeches after that. It's a lovely thought, but the "only in America" part probably isn't true. Alberto Fujimori, the son of Japanese immigrants, was not only nominated but elected President of Peru. And true or false, while the "son of Greek immigrants" line was heartwarming the first time Dukakis said it, it grew tedious when it became his de facto campaign motto, mentioned in countless speeches and TV ads for months. As governor, Dukakis had vetoed a Massachusetts law that would have required school teachers to lead students in reciting the pledge of allegiance. This became controversial when Dukakis's opponent, George H.W. Bush, ran ads impugning Dukakis's patriotism. Dukakis couldn't find the words to explain why a free country shouldn't compel teachers to require first-graders to memorize an oath and recite it every morning. Instead, Dukakis focused his campaign on economic issues, at a time when most Americans thought the economy wasn't a major problem. Bush, meanwhile, portrayed Dukakis as a "liberal" and "a card-carrying member of the ACLU". And while it's true, Dukakis was both these things, he seemed unable to effectively articulate that "liberal" and "American Civil Liberties Union" are not synonyms for "pinko" and "commie". In an infamous photo op, Dukakis put on an oversized military helmet and drove a tank, perhaps hoping it would make him look tough on defense. Instead it made him look loony, and the Republicans ran that footage to great effect in their own campaign ads. Other ads attacked Dukakis for his "prisoner furlough" program, whereby convicted criminals were let out of prison for weekends or special occasions. Bush won the election, and Dukakis faded from the news. He finished his third term as Governor in 1991, and has since taught political science at Northeastern University, and at Harvard's John F. Kennedy School of Government. In 1977, then-Gov. Dukakis ordered an investigation into the state's railroading and execution of Sacco and Vanzetti fifty years earlier. The report found what everyone who's looked into the matter already knew -- "that there are substantial, indeed compelling, grounds for believing that the Sacco and Vanzetti legal proceedings were permeated with unfairness". Instead of giving them a posthumous pardon, though, Dukakis proclaimed 23 August 1977 "Sacco and Vanzetti Memorial Day", called for "removing any stigma from their names", and asked people "to pause in their daily endeavors to reflect upon these tragic events".